I consider pesto to be a special treat. We don’t have it very often, but I just love it. 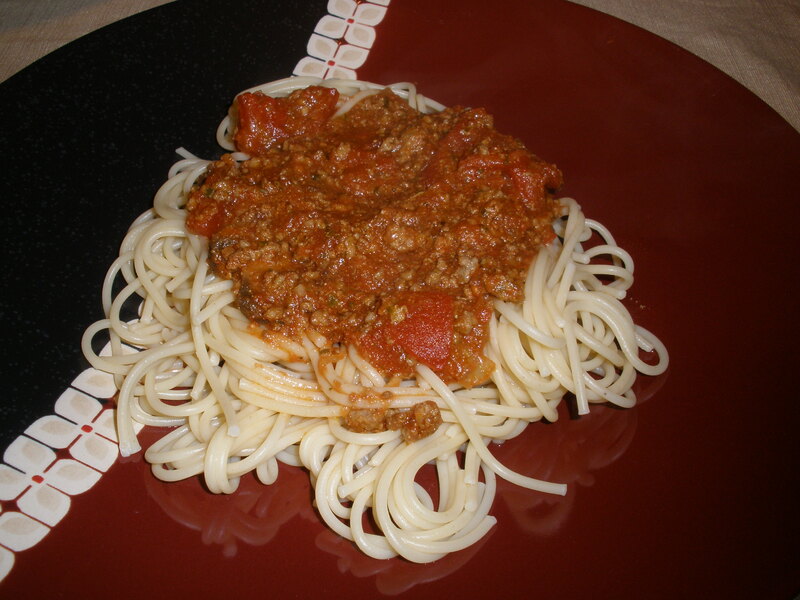 That’s why I was really intrigued by this recipe for Pesto Meat Sauce when it popped up on What’s Cookin’ Chicago? I couldn’t wait to try it. This sauce was really flavorful. The pesto was definitely prevalent, but not overpowering by any means. It’s very meaty, too, which makes for a very thick sauce. If you like your pasta sauce a bit thinner, adding in another half can of crushed tomatoes probably wouldn’t hurt. I might do that next time. I used my 3.5 qt. crockpot and it filled it to the brim! I was really nervous that it wouldn’t fit once I started adding ingredients, but it all worked out ok. Thanks to my mother-in-law giving me a bunch of mason jars for Christmas, I was able to freeze a bunch for easy dinners down the road. (Now that we have a new upright freezer, I’ve been kind of obsessed with making freezer meals.) I froze seven 12 oz. jars of sauce, in addition to what we ate on the day it was made. In a large skillet, add the ground beef and pesto. Once the beef is browned, drain and then add to the crockpot. Add the remaining ingredients to the crockpot and stir to combine. Cook on low for 8-10 hours or on high for 6-8 hours. Serve over your favorite pasta and enjoy! Rick and I just got back from a wonderful vacation! We cruised the Southern Caribbean, making stops in the Bahamas, Curacao, and Aruba. It was a very refreshing 7 days, but now we’re back home and looking forward to the holidays! Before we left for vacation, I planned ahead. I knew that when we returned home, we would be sick and tired of eating out and craving a home-cooked meal. However, with our plane landing at 6 p.m. on Saturday, I also knew that I probably wouldn’t have the time or the desire to go grocery shopping before lunch on Sunday. That’s where I got the idea for a crockpot dump chicken recipe. It’s simple. Prepare all ingredients ahead of time, place in a gallon-sized freezer back, and freeze. Saturday night, all I did was move the freezer bag out of the freezer and into the fridge. It was defrosted by Sunday morning, so I popped it in the crockpot for 4 hours on low. All I had to do was whip up some rice and lunch was served! It worked out perfectly, and tasted great, too. Plus, we had about 4 more servings left for lunches during the week (it made 6 servings total). To freeze: Place all ingredients in a gallon-sized freezer bag. Lay flat in freezer. The night before you want to prepare the meal, move the freezer bag from the freezer to the refrigerator and thaw overnight. In the morning, dump contents of freezer bag into crockpot. Cook on low for 6-8 hours or high for 4 hours. 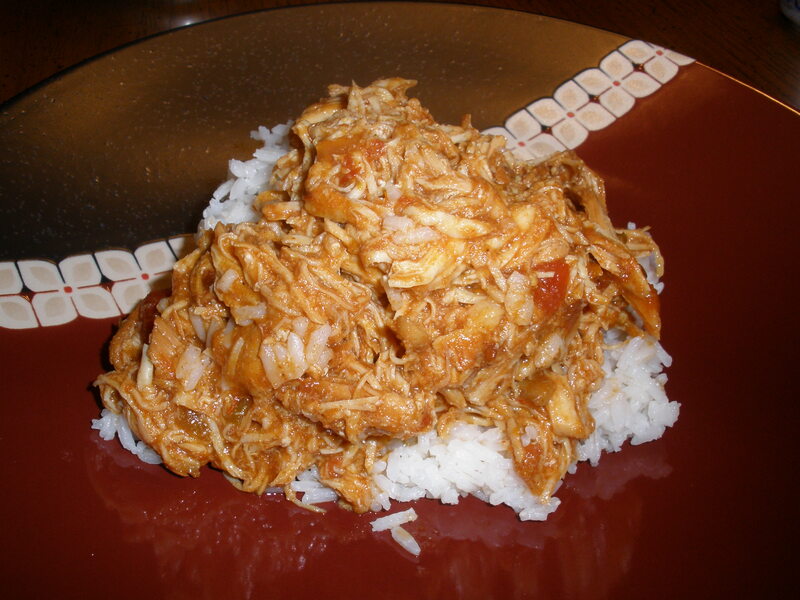 Shred chicken, serve over rice, and enjoy! We have finally moved into our new house! We’ve been here about 3 weeks now, and it seems like things are getting settled. We still have a lot of small things to accomplish, but it’s definitely feeling like home. Because of our moving to a new city, my commute to work got a lot longer than it was before. To make dinner a bit easier on myself, I am relying on freezer meals for a lot of our weeknight meals. That way, dinner is ready almost as soon as I get home! Soon after we moved in, I put together several dump chicken recipes and froze them to use later. (They are called dump chicken recipes because all you do is combine all the ingredients in a gallon-sized freezer bag, freeze, thaw, and then dump them into your crockpot!) My plan is to use them about once a week so we don’t get tired of them. So be on the lookout for more dump chicken recipes soon! This sweet salsa chicken recipe is the first. It reminded me a lot of the salsa chicken I’ve made a few times, which, once you think about it, makes sense, as the ingredient list only differs by one or two. This dish had added sweetness from the apricot jam, and tasted less “thick,” probably from the lack of the cream of mushroom soup. If I had to choose, I think I still like the first salsa chicken better, but this is definitely a good alternative for something different! To freeze: Combine all ingredients in a gallon-sized freezer bag. Seal tightly, and lay flat in freezer. To cook: Remove bag from freezer the night before, and lay flat in the refrigerator to thaw overnight. In the morning, dump the entire contents in your crockpot. Cook on low for 6-8 hours. 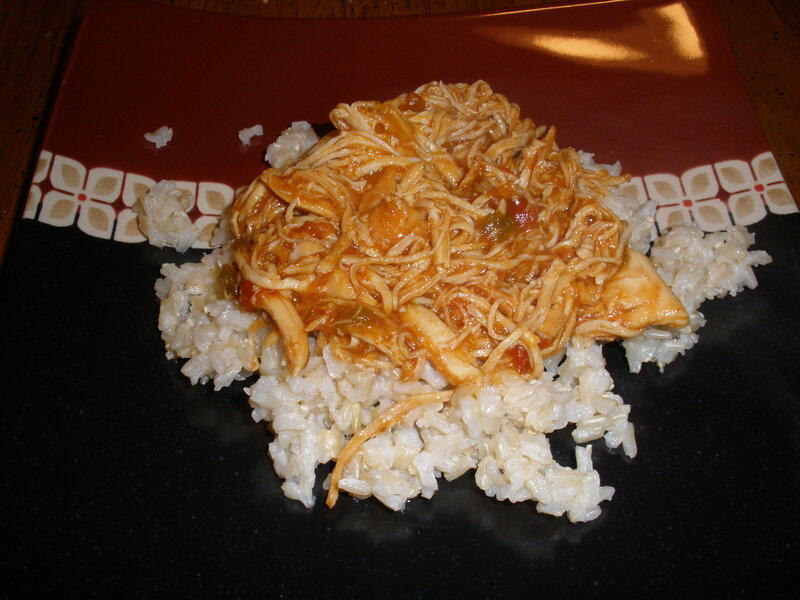 Shred chicken and serve over rice. Growing up near Cincinnati, I was raised on Skyline chili. Now that I’ve moved away from the area, there are, unfortunately, no Skylines where I live. But every now and then, I still get a huge craving for a 4-way, so I decided to try my hand at making the chili myself. While this recipe did not end up tasting exactly like Skyline, it was, in my opinion, close enough to satisfy my craving. 5-way: Spaghetti, chili, cheese, beans AND onions. Sound delicious? Trust me, it is! This recipe makes a lot … based on how many portions we divided up for the freezer, my best guess is it makes at least 14 servings. It’s a great freezer meal for nights when you just want a quick dinner. Just thaw, heat, whip up some spaghetti, and you’re all set! Or, use leftovers for Skyline Chili Pizza. 2. 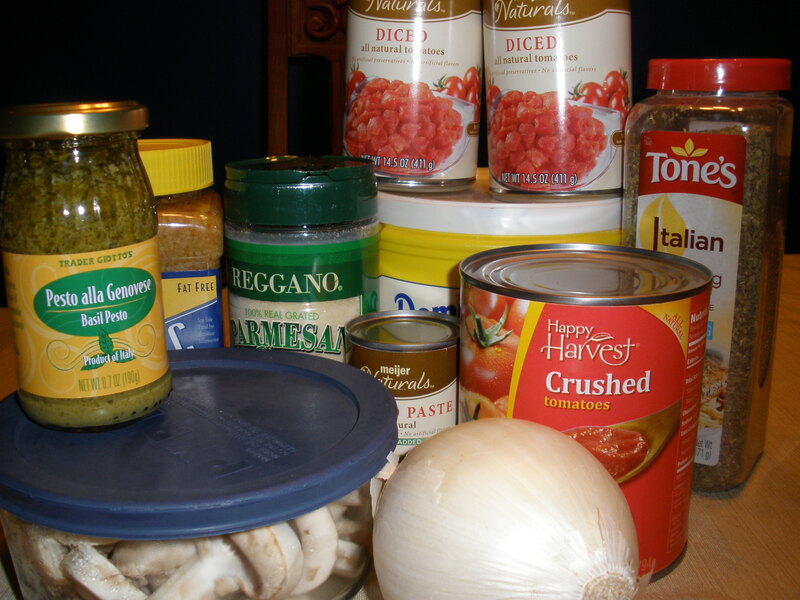 Combine all ingredients in crockpot. Stir well, and cook on low for 12 hours or longer. Rick and I finally got to take our summer vacation last week! We spent a wonderful week on the beach in South Carolina. Thinking ahead, I wanted to prepare an easy meal that we could just toss in the crockpot the day we got back from vacation. I figured we’d be tired of eating out, but wouldn’t feel like cooking after making the 12 hour drive back home the day before, so this freezer meal was the perfect solution. I dumped all the ingredients in a 1 gallon freezer bag and froze it. When we got home from vacation on Saturday, I placed the freezer bag in the refrigerator to defrost overnight, and then dumped all the contents of the bag in the crockpot in the morning. 8 hours later, we had a nice dinner waiting for us! For freezing: Place all ingredients int a 1-gallon freezer bag. Lay flat in freezer. To thaw: Take the bag out of the freezer the night before, making sure the frezer bag is completely sealed. Place bag on a shel furthers rom the freezer and lay flat. Put chicken in crockpot and dump contents of bag on top of it. Cook on low for 6-8 hours or high for 4-6.